As we move through the winter months, it can be tough to spend a lot of time outdoors. The Hocking Hills isn’t just a summer destination, it’s also a great way to spend a weekend during the winter, especially when the cabin comes equipped with a winter essential: A hot tub. These cabins vary in size and price, but one thing they all have in common is a bubbly, warm, inviting hot tub to relax in. Spend your day on a winter hike or reading a book by the fireplace. Then, when the sun goes down, you can head outside for a little stargazing and a soak in the tub. 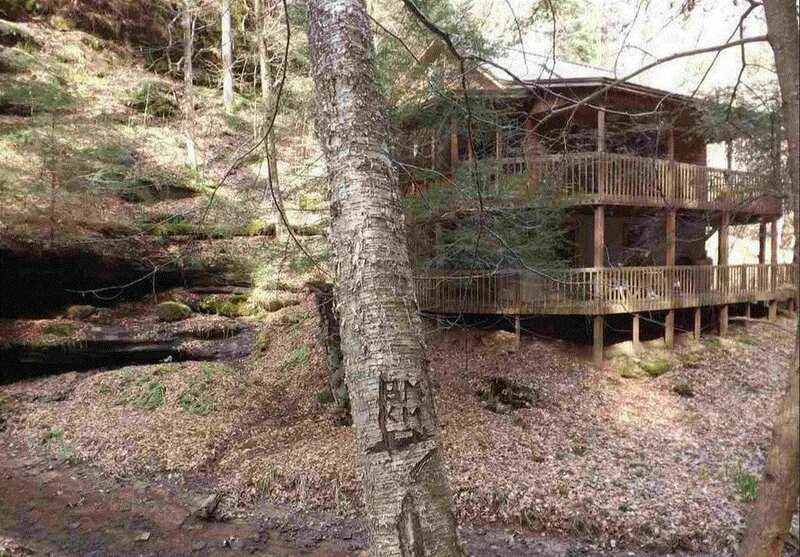 Here are 7 amazing cabins with hot tubs in Hocking Hills. Are you ready to relax? 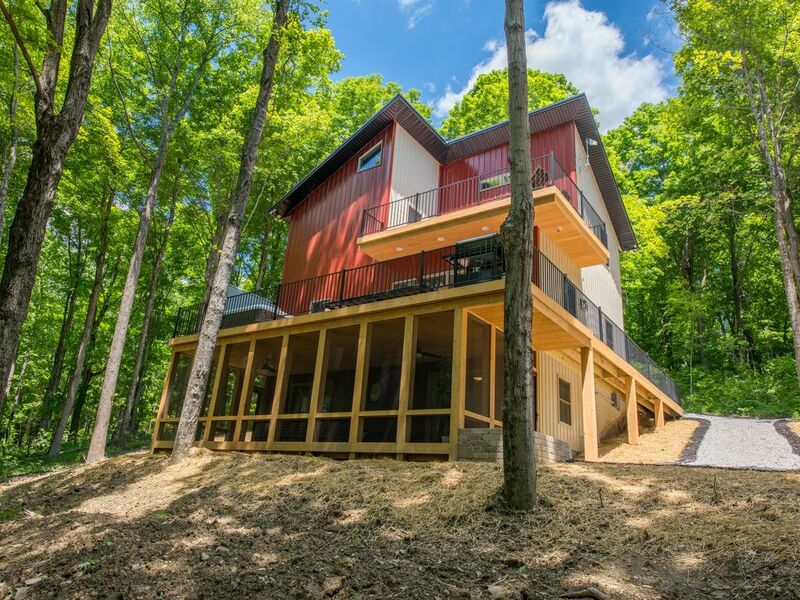 Hocking Hills may be known for its cabins, but if you’re on the hunt for something more modern, don’t worry. This stunning 3 bedroom, 2 bathroom home will keep you from missing all of the upscale amenities you want. The price varies, but you can snag this beautiful home for as little as $299/night depending on which dates you choose. For more info or to book your stay, please click here. Looking for a cozy little getaway? Couples Paradise may just be the weekend retreat of your freaking dreams. This little cabin has two bedrooms and two bathrooms and even comes equipped with candles and romantic themed decor, which means you and your special someone can really go all out. Couples Paradise is available for $305/night with a two-night minimum. For more info or to book the cabin please click here. If you’re in search of luxury, look no further than Webb Pointe Lodge. This massive, 3,800 square foot lodge sleeps up to 16 people, making it perfect for large families or groups of friends to get away. It even has it’s own private media room with a 13-foot screen. 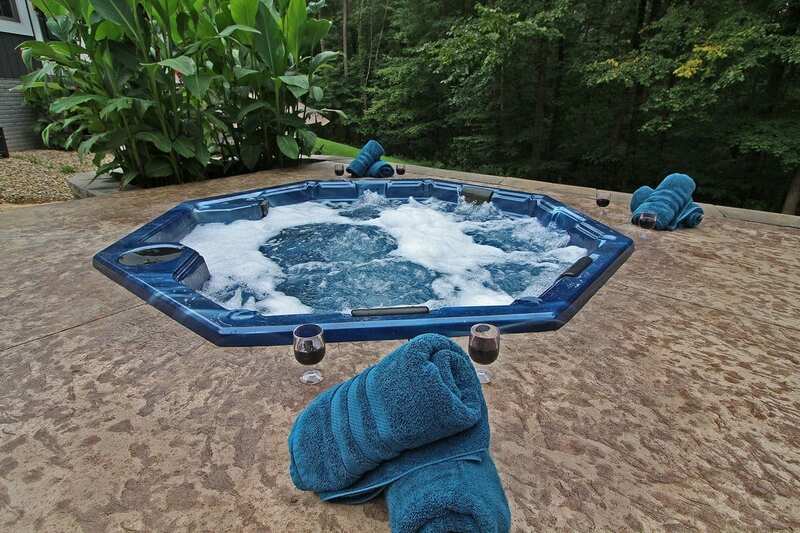 In addition to the very inviting hot tub, the property also has a heated inground pool and indoor game room. Webb Pointe Lodge is available to rent for $629 per night on weekdays and $849 on weekends. For more information, please click here. Looking to unplug? Hidden Falls Retreat is the place for you. There’s no wifi or cable here, just the beauty of nature. The cabin is surrounded by woods, stunning rock formations, and a seasonal waterfall and stream. It is the definition of private! The cabin can sleep up to six people, with 3 queen beds and has two wraparound porches that are covered, including the porch that has the hot tub! Hidden Falls Retreat is available Sunday through Thursday nights for $165 and $240 Friday and Saturday. For more info about Hidden Falls Retreat, please click here. 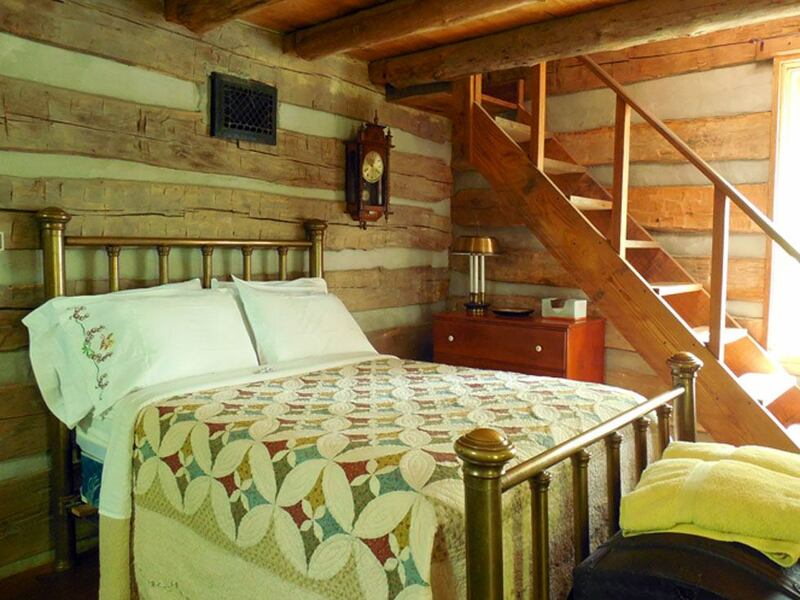 This authentic log cabin is the perfect cozy place to head for the weekend. The cabin is located in a serene, wooded area, just a few miles from some of Hocking Hills biggest attractions. The 20-acre property includes its own pond, hidden cave, and frequent animal visitors! Hidden Cave Cabin is available Sunday through Thursday for $159 per night and Friday through Sunday $229 per night. For more information, please click here. 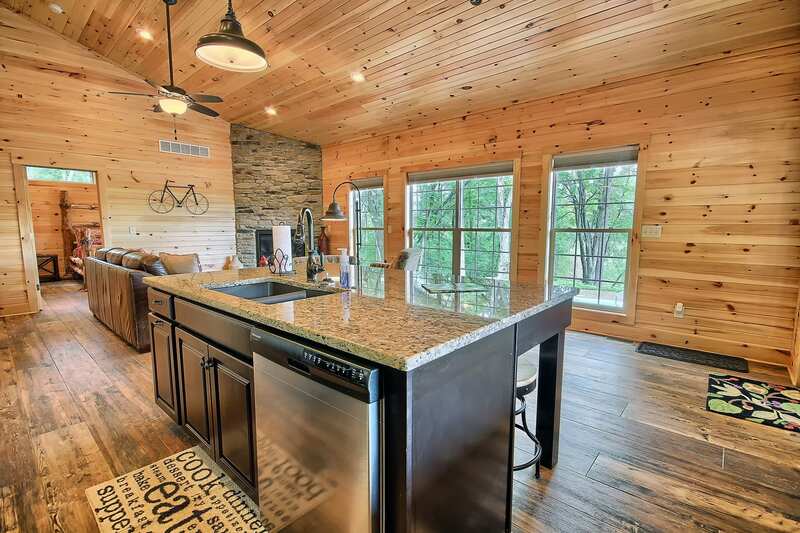 The Woodford Cabin at Bourbon Ridge Retreat is a high-end, luxury cabin. The property features vaulted ceilings, huge windows, a beautifully updated kitchen, and more. Woodford can accommodate 4 people. The cabin has a pool and hot tub, both of which are heated year round! 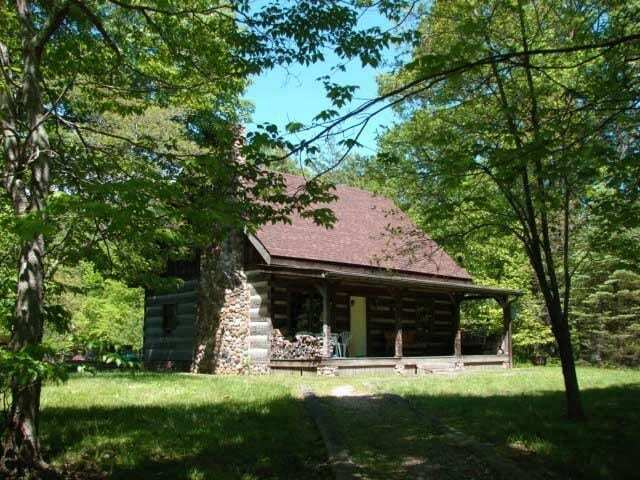 The Woodford Cabin is available to rent for $245 per night on weekdays and $345 per night on weekends. For more information, please click here. Mill Cabin captures the rustic elegance that everyone loves about the Hocking Hills. The cabin is small, with just two bedrooms, but what it lacks in size, it makes up for in charm. Just outside the cabin, you’ll find the hot tub, surrounded by woods, the perfect place to relax and unwind. Mill Cabin is available to rent for $175 on weekends and $135 on weekdays. For more information or to book your stay, please click here. What are you waiting for? It’s officially weekend getaway season!